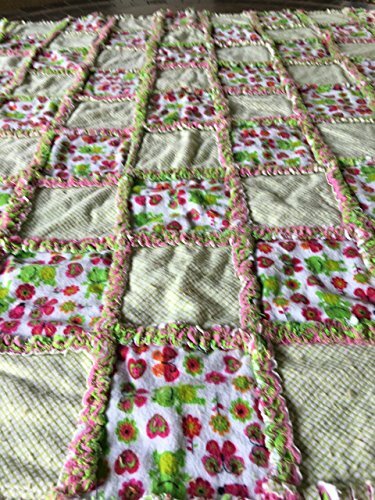 Sweet little frogs surrounded by flowers, and green checked squares, put them together with a pink and green checked backing, and you have a baby rag quilt worthy of your little girl's room! Draped across the crib, or thrown over that big comfy chair in the corner, this quilt will provide the focal point that will pull the whole room together. View More In Quilts & Bed Covers. If you have any questions about this product by Laughing Heart Designs, contact us by completing and submitting the form below. If you are looking for a specif part number, please include it with your message. Flannel Nursery Baby Quilt Red Yellow and Blue 27" x 30"